There is currently a high level of interest in the field of nonlinear guided wave optics with the availability of nonlinear materials and their use in new areas of application. This is particularly the case for solitons and other types of nonlinear pulses in optical fibers, high capacity dispersion-free communications. Further, soliton-like beams in highly nonlinear materials, such as organic polymers, are being studied with a view to using them for fast-switching purposes in devices where the light creates its own guiding channel. 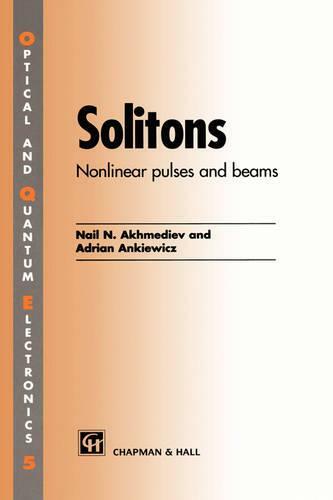 Written by two authors who are at the forefront of this research, Solitons provides a thorough treatment of the applications of switching devices. It presents the results of the most up to date research on the subject in an accessible manner and adopts a unified approach to solitons in fibers and the devices which use them. The book is an essential reference work for both professional engineers working in optoelectronics and telecommunications companies and graduate students and researchers in the area.